This image shows the inside of the Rosette Nebula. I have captured Evaporating Gaseous Globules (EGGs). Those spherical clumps of dust and hydrogen (EGGs) that are shown at the tips of my green arrows are collapsing with gravity into dense spheres which will (in the next few thousand or million years) generate enough heat and pressure at their cores to fuse hydrogen together and initiate fusion, giving birth to a new star. Every star you see in that photo started as an EGG in the same way, and by studying the nebula we can easily tell where the next new stars will be born. The exposure time for this photo was 45 hours over two months (about 4 hours per night when conditions permit). 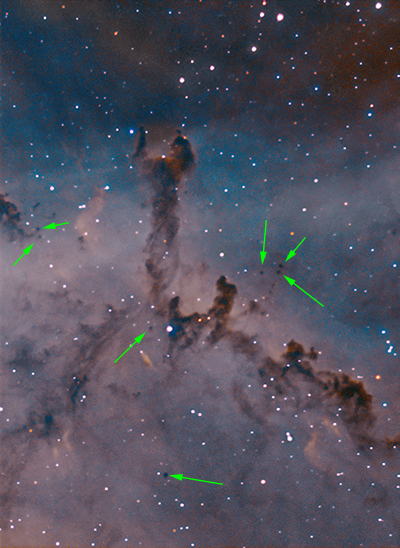 The object is 5200 light years away, which means we are seeing it as it was 5200 years ago, those EGGs (shown at the tips of my green arrows) have probably already become stars, but we won’t know for another 5200 hundred years. Usual suspects, C14 riding an AP1600GTO hiding inside a Sirius Observatory. Processing PS and PI. Thanks guys. I am out of practice on the processing (amazing how fast you can forget some stuff), but I need to start dithering more (quite a bit of noise which I managed to get rid of). I have a ton of data on the tarantula that I'll process shortly as well. I'm glad to be at least producing something.